The history of Taylor Guitars spans over 40 years and Taylor Guitars has evolved into one of the world’s leading designer, builder and seller of acoustic guitars. The company was originally started in El Cajon, California and was owned by Sam Radding and named American Dream, a guitar making shop. In 1972 they hired a young 18 year old by the name of Bob Taylor. Taylor worked for American dream for 2 years before Radding decided to sell his business. Taylor along with two other co-employees, Steve Schemmer and Kurt Listug, decided to buy the business and called it Westland Music Company. They began to design and produce their own style of guitars. The new owners decided that Westland Music Company was too long of a name and logo to put on the head of their guitars. At first considering Listug as their new brand, they reconsidered and decided that Taylor would be a more suitable name for the American guitar market. As the new partners settled into business Listug took control of the company’s business responsibilities while Taylor focused on guitar design, innovations and production. In 1976 the company expanded from a simple guitar making shop into retail stores and began their growth path that has today grown to a worldwide name brand with two state of the art factories and over 900 employees that produce hundreds of top line guitars every day. In the early 80’s Bob Taylor began pioneering the combination of high tech manufacturing with old fashion craftsmanship, marking him as one of the most visionary guitar producers of his time. Taylor have established a solid reputation for being easy to play, having a great sound, a beautiful design and with a famous neck recognized by guitar lovers everywhere. 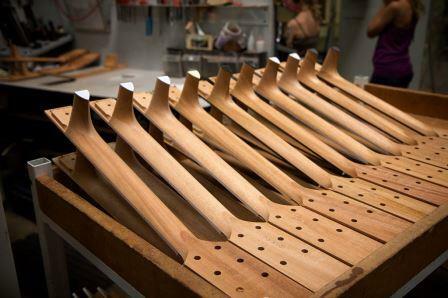 The patented Taylor Neck was the first major innovation in acoustic guitar designs in over 100 years. Some of Taylor’s other unique designs include the T5, a hybrid acoustic and electric guitar and the Expression System which was the revolutionary pickup for acoustic guitar amplification. Today the company has an active network of dealers and sells the popular Taylor Guitar through hundreds of retailers in locations all across North America as well as distributing internationally in 60 countries including a European distribution warehouse and factory service center in the Netherlands. 1974 – Westland Music Company is renamed Taylor Guitars for the sake of branding and a shorter logo for the company’s guitar heads. 1976 – Taylor Guitars expands from a guitar designing and producing single store to retailers throughout the United States for the first time. 1981 – The guitar company takes out a business loan for expansion and innovation through modern technologies and manufacturing equipment such as lasers, computerized mills and other proprietary machinery that will eventually lead Taylor to becoming a global innovation leader and designer in acoustic guitars and guitar manufacturing technology. 1995 – Bob Taylor begins replacing traditional luthier techniques for guitar making with a priority on exotic tone woods. Using old pallets from the warehouse as a resource he creates a guitar from the oak wood of the pallets that he names “Pallet Guitar”. The famous guitar also features a formica and pearl fret that resembles a forklift. The original unique Pallet Guitar is on display at the Taylor Guitar factory in El Cajon, California. 25 replicas of the guitar have been reproduced and sold to collectors. 1999 – Taylor releases a new design labeled NT (New Technology) featuring a bolt on neck that differs from any other guitar design by using a single piece of continuous wood that reaches all the way to the 19th fret supporting the fretboard. This design simplified the neck realignment or reset service sometimes required on acoustic guitars. 2004 – The ES system is introduced, also known as the “Expression System”. Taylor’s own patented pickup system for acoustic guitars. The ES system was an option available on 500 series and above plus the 30th anniversary limited edition series. ES was also offered as a customization for 300 and 400 series orders as well as some of the older Taylor designs. 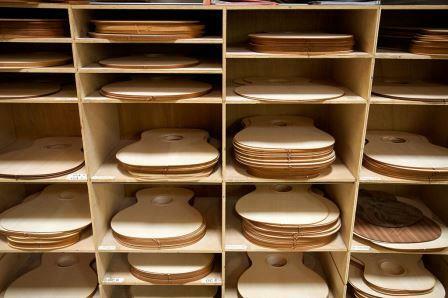 2011 – Taylor Guitars expands into the European market with the opening of a distribution warehouse in the Netherlands. 2014 – The United States State Department awards Taylor Guitars with the ACE Award – Award for Corporate Excellence. Recognizing Taylor’s commitment to responsible practices on obtaining ebony for its instruments raw materials. Today – Taylor’s modern factory and headquarters remains in El Cajon, California, a small town east of San Diego. The factory has expanded and grown to over 145,000 square feet and is available for public tours Monday through Friday at 1:00 pm except for holidays. And thousands of more famous, professional and novice guitar players alike. Taylor has always been not only an innovator in the guitar industry but a forward thinking conservationist company as well. Sourcing their wood with environmental sustainability is at the front of priorities. The company is dedicated to best practices in bringing ethically harvested tonewoods to the market with involvement in forest management best practices and new models of reforestation. With this responsible and proactive action combined with the beautiful sounds, attractive designs, flawless and innovative craftsmanship, it’s no wonder the Taylor Guitar is still one of the most desired acoustic guitars in the world maintaining the fine reputation in the marketplace today that it has throughout its history. You never know what the future is going to bring when an 18 year old kid walks into a guitar store and asks for a job. He or she may just grow up to become one of the most successful guitar designers and producers in the world. Just ask Bob Taylor and Kurt Listug.